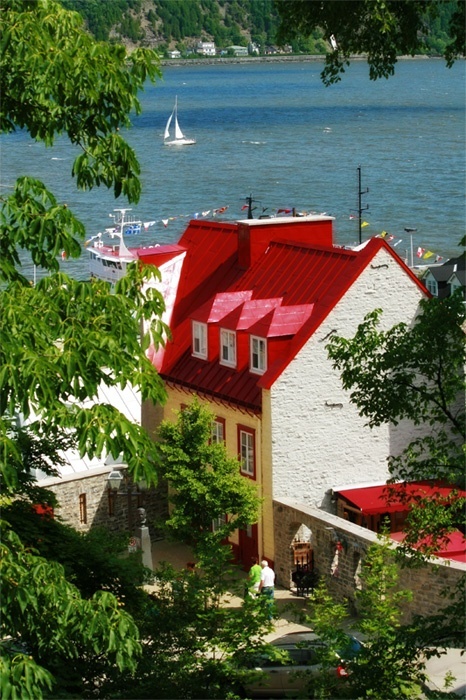 Old Quebec is a historic neighbourhood of Quebec City, the capital of the province of Quebec in Canada. Comprising the Upper Town and Lower Town, the area is a UNESCO World Heritage Site. Administratively, Old Quebec is part of the Vieux-Québec–Cap-Blanc–colline Parlementaire district in the borough of La Cité-Limoilou. The area is sometimes referred to as the Latin Quarter, but this title refers more to area around the Séminaire de Québec, the original site of Laval University. In 1963, an area in the historic area of the city was named a "Declared Historic District" by the province of Quebec, and was expanded the following year to an area of 135 hectares (330 acres). It includes 1,400 buildings within the neighbourhood of La Cité, including the promonotary of Cap Diamant and a strip of band below the cliffs, between the Saint-Charles River and the Saint Lawrence River. In 1985, it was recognized as a World Heritage Site by UNESCO.